FIRST THING in the morning David Austin liked to smell his roses. He would step out of his front door, the door to the same lovely Queen Anne house in Shropshire where his granny had lived when he was a boy, and sniff the air. Before the public came to ogle his flowers, and with the scent of the petals still dew-fresh after the night, he would turn left, always following the same route: south-east, face to the summer sun, down the Long Garden with its three sets of double borders filled with roses—roses he had spent half a century breeding—round the concentric beds of the Victorian Garden where grew more roses, then along the long canal of the Renaissance Garden and finally through the display of hybrid teas, floribundas and English roses in the Lion Garden. The floral displays were much more than a way of advertising David Austin Roses, though they were that too, for the business now sells its roses in over 50 countries and has become the biggest employer in the area, offering work to more than 200 people. They were Mr Austin’s testament, an earthly reflection of everything he thought and believed about roses. The cold formality of the garden design, with its lines and angles and traditional box beds, was warmed by the climbing, rambling, wayward joy of the plump bushes, in an array of different colours but all with a healthy glow and sprightly charm that made them seem quite human. Mr Austin saw that humanity in the curling petals that fell in disarray during the night. It reminded him of the blonde tendrils that framed the cheeks of his young grand-daughter, Olivia, after whom he had named one of his roses in 2014. It made him think of the rose as a symbol of beauty and love, and in England of history, politics and war. It brought to mind the English poets who had written about roses—Thomas Campion, Andrew Marvell and his favourite of all, John Clare—poets whose works he read and reread in the library of his granny’s house, which in turn inspired his own verse, gathered together in 2014 into a slim paperback called “The Breathing Earth”. Mr Austin’s wife, Pat, had carved the statues that provided the focal point for many of the gardens’ paths. Although she died more than a decade before he did, he was reminded on his morning walk of their very two different natures—his precise, hers artistic and messy. He reflected on humans’ troubled relationship with perfection, and how beauty is enhanced, never diminished, by the alchemy of character and charm. And then, just before he went in for breakfast, he reached for one of the fullest flowers, brought it up close and breathed deep of that old rose fragrance. Whatever his mood, the scent calmed him down and raised his spirits. No other flower ever had the same effect. Mr Austin was born into a rapidly changing world, though that may not have been obvious at the time. Nineteen when peace finally came in 1945, he had seen two-thirds of his father’s cereal farm requisitioned to be made into a wartime airfield for the RAF. The family would never get those acres back. The land of “lost content”, which is how A.E. Housman, another Shropshire lad, had once described the county, would also never return. A child of the earth, Mr Austin felt the tug of post-war social change in the flowers and fields around him. The fashion for stiff, formal roses was all wrong, he felt. Like the big houses that were learning to live a simpler, freer life and manage with fewer servants, their English gardens—just as their English rose bowls—were calling for a more honest, down-to-earth aesthetic, a real English rose. Roses have been grown in gardens for hundreds of years. You see them, he wrote, on fifth-century north African tombstones, on coins from Rhodes, in Persian miniatures and in Dutch still-life paintings. Early Christianity turned its back on the flower’s pagan past, and the Virgin Mary became the “rose without thorns”. In the Middle Ages roses were brought into monastery gardens as medicinal plants, and the French Empress Josephine used the gardens of her chateau at Malmaison, near Paris, to amass a vast collection of the shrubs from all over the world. Shropshire was just another stop on that journey. Mr Austin set out to combine two great traditions: to take the shape, scent and character of old roses, such as gallicas, damasks and albas, and combine them with the array of colour of modern hybrid tea roses and floribundas to create a plant that would be free of disease and would flower repeatedly from early summer to the end of autumn. Armed with “Practical Plant Breeding” by W.J.C. Lawrence, a dull-looking little volume that was the plants-man’s bible from the 1930s, he set to work. It takes eight years, on average, to bring a new rose to market. In 1961 Mr Austin named his first successful offspring “Constance Spry”, after a former nurse who became Britain’s most famous flower-arranger. A pale pink climbing rose, it looked lovely in bloom—but flowered only once a year. 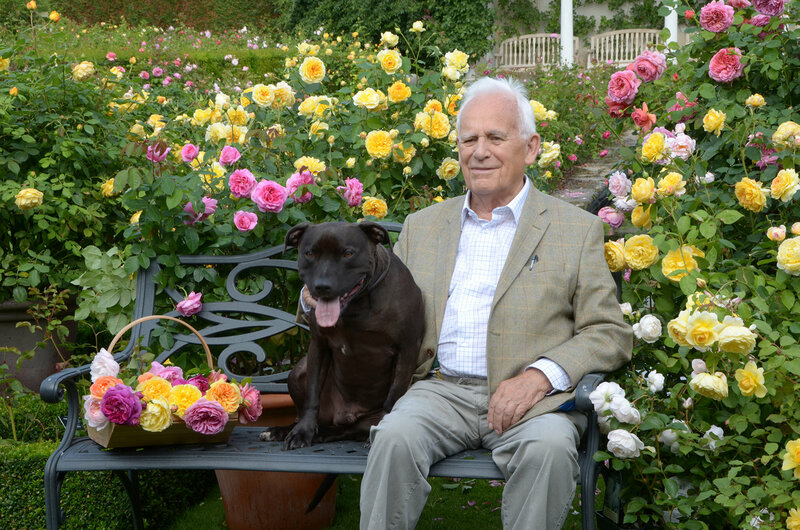 In 1969 he took his “Chaucer” roses, roses that now flowered repeatedly for six months, to the Chelsea Flower Show. (Over the years he won 24 gold medals at Chelsea.) He called his new creations the English Rose, and appreciated them, as he said in one of his poems, “for their lovely humanity”. Today David Austin Roses has an annual income of more than £17m ($22m). Roses are happy to cross with each other, he found, which makes them easy to breed, at least technically. No need for a magnifying glass or microscope; just a knife to harvest the pollen and a small paintbrush to apply it to the stigmas, and then see what comes up. The challenge is not to produce or even to create a perfect flower, so much as to bring out a plant’s best qualities: its scent, shape, colour, its vigour, resilience and, most of all, its enthusiasm for flowering over and over to brighten up an English summer. Every cross is an exercise in hope. For David Austin, breeding roses, like raising children or indeed like living, was about trying and failing—and trying again.